We have some GREAT things in store for our 2018-2019 program year. We’ve laid out a calendar for the “Adventures” each den will be working on each month. We’re starting the year with an elective, so that new Cub Scouts who join in August or September won’t fall behind in making their rank. We’ve scheduled so that all Scouts should be completed with their rank requirements in March, to help ensure that achievement is met before the possible onset of Spring sports, Spring Break, and the coming summer. 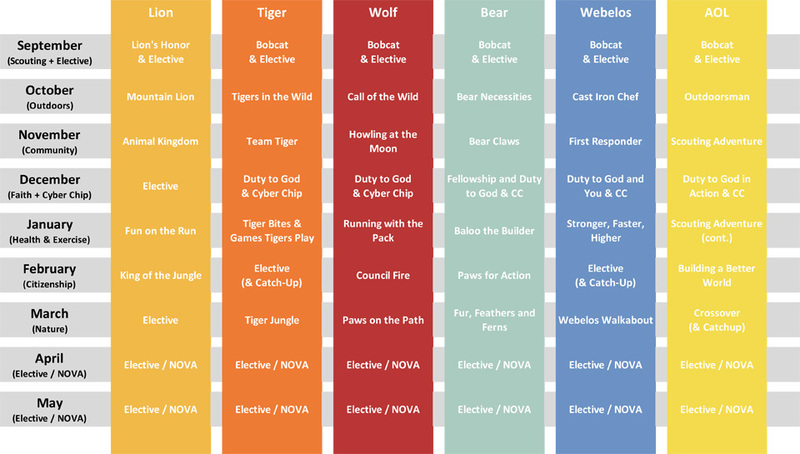 For more details about the requirements and electives available at each rank, download each PDF linked here: Lions, Tigers, Wolves, Bears, Webelos, Arrow of Light. Our calendar accounts for these with our first and last months of the year. However, Cub Scouting largely happens AT HOME. We encourage all parents to work with their Cub Scouts to explore electives each and every month. Scouts are Trustworthy. If you log in Scoutbook that you completed part or all of an Adventure with your Cub Scout – we believe you. There is no need to vet and review every Adventure earned with your den leader or pack leadership. If you have any questions, we are always happy to help and answer. But otherwise, we fully encourage parents to work with their Scouts to pursue new and varied interests. 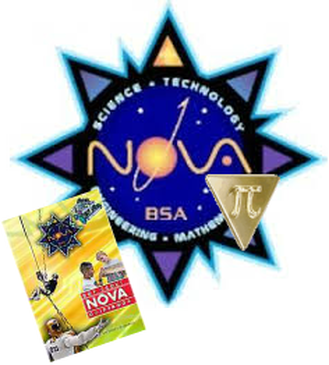 Please Note – NOVA Awards must be administered by a a registered NOVA Counselor. GREAT news is that parents can sign up to be NOVA counselors. 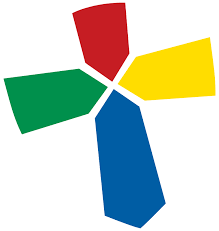 During December 2018 and January 2019, Pack 404 will offer the “God and Me” (1st – 3rd Grade) and “God and Family” (4th – 5th Grade) Awards. Pastor Hess of Southway Community Church has agreed to lead the classes. Interested parents are encouraged to assist as Mentors. The Pack is working with a local Hindu Temple to serve those Scouts who are interested in the Dharma Award. Scouts who adhere to other faith traditions should inquire with the Cubmaster so that we can help connect you to resources within the Scouts BSA and with your local temple or mosque. Classes will take place the first two weeks of December and/or the month of January (depending on whether four or six sessions are needed) Date and time to be set based on attendee and teacher/counselor schedule. “God and Me” and “God and Family” awards will be awarded on Scout Sunday at Southway Community Church – February 3, 2019. Note: Depending on rank, the religious award can satisfy some or all of the requirements of the faith-based adventure for that rank. It is also one of two awards that can be worn on the Boy Scout uniform as a youth or adult (the other being Arrow of Light). Also, each grade-level award can each be earned by a single Scout. For example, they can earn “God and Me” once during their Tiger-Wolf-Bear years, and then earn “God and Family” once during their Webelos-AOL years.